This two-part post is by a former student of mine, who also happens to be an author of popular history. Karen has written on fun things like fashion and Essex Girls (in history). Her original, longer post is taken from a digital group project on Margaret Baker’s recipe book that was complete for my 2016-7 module, The Digital Recipe Book Project. 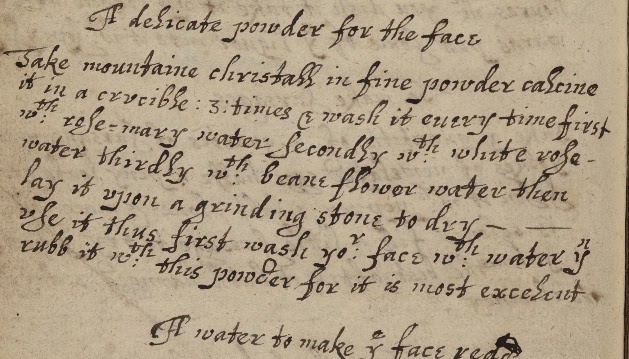 A delicate powder for the face, Margaret Baker, Folger Shakespeare Library, V.a.169, f. 97. 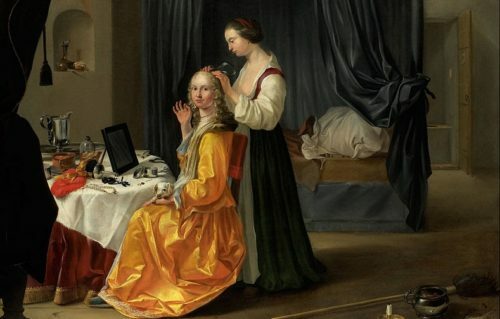 In the late seventeenth-century, recipe book compiler Margaret Baker listed twenty-eight recipes for beauty, amidst medicines for dropsy and distemper and recipes for custards and the stewing of racks of mutton. 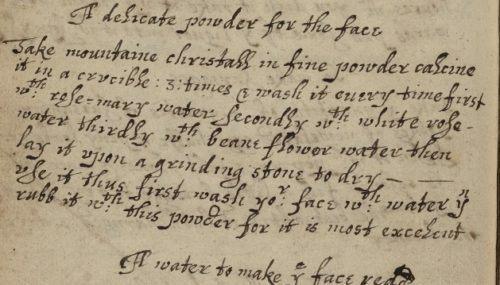 Baker’s recipes for beauty ranged from face powder and whitened hands to face waters and hair growth treatments (ff. 51, 109). Baker had the chemical knowledge to beautify. 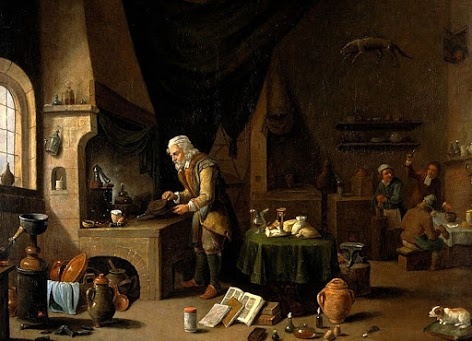 Not only do the beauty treatments suggest her agency, status, and knowledge, but hint at strong connections between beauty and alchemy. It was The Lady Croon’s recipe for pomatum (f. 106) that first caught my attention, pointing to chemical transformation in the social sense. While Lady Croon appears to be the author of the pomatum recipe, the contributor’s name “Mistress Anne Corbett” appears in the margin. If Mistress Corbett had passed on the recipe directly from Lady Croon, it seems likely that both had the means to make the pomatum and shared in an aristocratic social network (or aspired to one). Lady Croon’s pomatum was more than a means of creating a beautifying substance; the transference of knowledge was a gift that affirmed friendship bonds, social standing, and aspirations. Pomatum was a greasy, waxy, or water-based substance used to style hair before applying powder. Given that powdered hair was a sign of class identity, the recipe suggests that Baker may had occasions to attend polite gatherings. Dressing one’s hair and caring for one’s skin required ‘self knowledge and inward identity and knowledge beyond one’s self reflecting an understanding of the body, its cultural and social meanings’ (Snook, 7). In a patriarchal society, in the absence of of wider legal and political representation, the ability to transform oneself was powerful information. One’s face and body was the blank canvas for identity and social standing. For famed beauty Margaret Cavendish, Duchess of Newcastle (b. 1623), fair white skin was even political. She insisted that her mother was ‘a woman with perfect skin and politics’; skin thus represented social order and familial harmony–and, in her case, the Royalist cause. Other women, too, recognized beauty as nature’s coin and a way of forging identity within their own domestic structures and hierarchies. Unknown, Lady at her Toilet, c. 1650-60. Source: Wikimedia Commons. Of course, the real achievement for women was not the face and body they showed the world. It was the the female knowledge of how to manipulate nature through chemistry and alchemy in order to transform basic materials into healing and beautifying physic. There were relatively few make-up items in Baker’s book, as we today would understand them. Many were even gender neutral. Her products include items to ‘take away heat and pimples in the face’, ‘to make a clense from spotts’, ‘waters for the face’, ‘to take away freckles’, ‘to stop hair falling and grow thicke’, ‘to take away chapped hands’, and to keep the face smooth’ (ff.14, 44, 51, 83, 109, 49, 92). In addition there are instructions for making ‘a butter to curl the hair’, ‘to make hands soft and white’, ‘make a perfume’ and to perfume gloves’. (ff. 94, 85, 31, 98). What many of the recipes have in common is that they were designed to transform the skin rather than cover it. Even hand ointments had a higher purpose, not just removing blemishes; keeping hands soft avoided drying and cracking, and becoming susceptible to disease. Protecting and preserving the skin was central to beauty. Oyle of talcum, Margaret Baker, Folger Shakespeare Library V.a.619, f. 21.
into a well some yard & a halfe or two yardes from the water nere to the well soe it touch it not’ & soe let it hang .20. or. 25. daies then if you find that it begine to cast out some oyle take it out of the well & set it in some moyst place, in some corner of your seller to defend it from the ayre: wind or other harmes & soe leaue it soe longe untill all the liccor become out of it. The result was powder that could be mixed with water to wash the hands and body, making ‘them very white, soft and free from freckles or spottes – good for ladies’. An alchemist in his laboratory. Oil painting by a follower of David Teniers the younger,. c. 1610-1690. Credit: Wellcome Library, London. 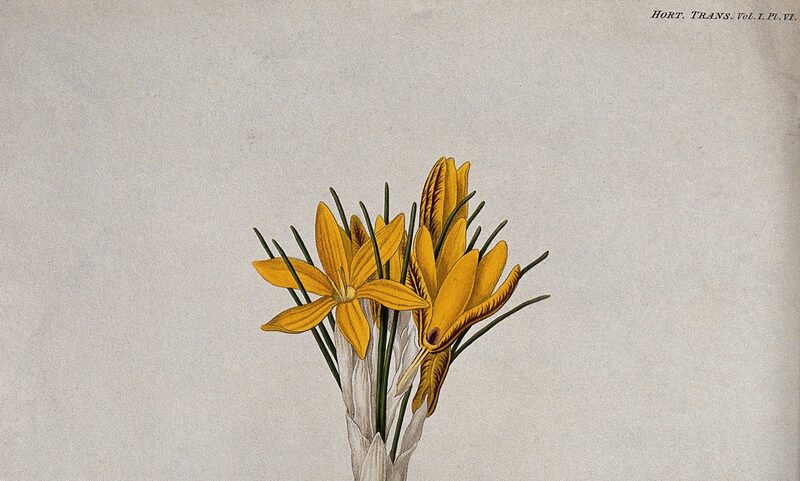 Sometimes, the connections between alchemy (or chemical medicine) and beauty were literal. Baker used mercury in both her medicinal recipes and beautifying physic. This was not just an ingredient. Its knowledgeable deployment put Baker within the (assumed) masculine spheres of medicine, surgery and alchemy. Throughout her book, there are clues that Baker read widely on medicine and alchemy. Baker’s recipes reveal her intellect and interaction with ideas of the day, as well as point to the uses of beauty treatments: transforming one’s body chemically and alchemically. Bodily transformations included protecting and beautifying the skin, or even enabling social elevation. 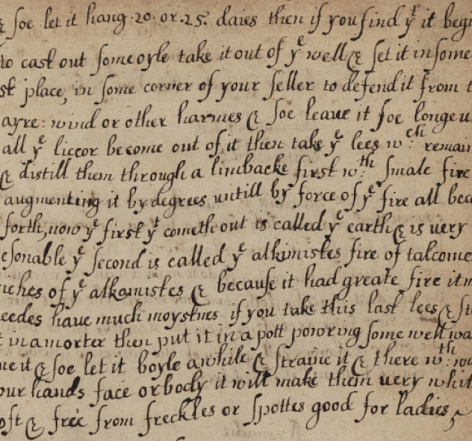 Beauty and alchemy sat close together in Baker’s book.